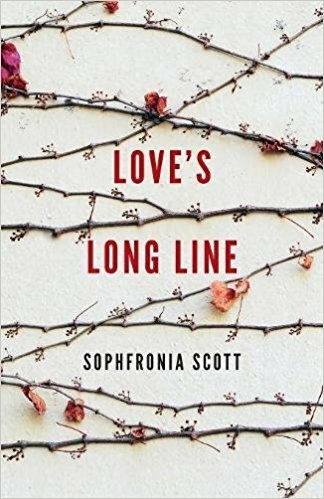 Sophfronia Scott’s collection of essays Love’s Long Line reminds us that a life lived with hope is a life full of possibility. While walking in New York City’s Central Park or visiting her emotionally absent mother in Ohio, Scott shows us what it means to find faith. In “Opening to Love,” Scott writes, “I am trying to learn how my heart works. This knowledge, I hope, could be the key to a kind of protection.” Rather than turn away from the childhood trauma her now-deceased father has caused, Scott turns toward the meaning of forgiveness in her adult life. Scott’s essay, “A Fur for Annie Pearl,” speaks to how valuable it can be to know our parents’ friends. Because sweet, honest Annie Pearl is a dear friend of Scott’s father, Pearl bears witness to all aspects of Sophfronia’s dad. Through her adult friendship with Pearl, Scott discovers signs of her father’s love. This essay reminds me how much it has meant to have had three of my father’s closest friends track my life: Bower, Morgan, and Kiwala. They always called me Buzzy, told stories about how much they loved my mum, Susan, talked of how she read so much and so widely, and shared their scary shark stories from their countless scuba dives with my dad. These men bore witness to my baby days and took loving care of our family after the suicide of my older brother Ian at age thirty-nine. Robert Bower gave me eloquent advice throughout my life, particularly when I was trying for the umpteenth time to break up with a certain ex. He’d tell me that I deserved a man who could show up emotionally. Morgan Wells told me stories about teaching diving physiology to medical doctors and using one of my dad’s papers that referenced super saturation. Robert Kiwala served as my proud bridesmaid when my husband and I eloped at the Bonner County Idaho courthouse nine years ago. Each of my father’s dear friends was not a constant in my life, but they entered and exited easily. I mourn the loss of witness with each one’s final exit. In Love’s Long Line, Scott knows how to find grace even in its absence: “What is grace? It is love where it does not have to be, where there is no reason for it.” In part because Scott endured a violent father and maintained her love for him, her writing shows a clear-sighted means of how an individual might encompass grace in the aftermath of trauma. The event seems to confirm my suspicion of God’s absence and yet in every moment as the cold day unfolded, I knew the only way I would survive the ongoing aftermath is if I kept proving myself wrong. And this would be a tremendous necessity because in the days that followed I experienced a terrible duality in which I felt the situation demanded I marshal every strength of who I was while at the same time feeling dismantled on every level. Renée E. D’Aoust’s Body of a Dancer (Etruscan Press) was a Foreword Review’s “Book of the Year” finalist. Recent anthology publications include Flash Nonfiction Funny, Not My President, and Rooted: The Best New Arboreal Nonfiction. D’Aoust teaches online at Casper College and North Idaho College. Follow her @idahobuzzy.